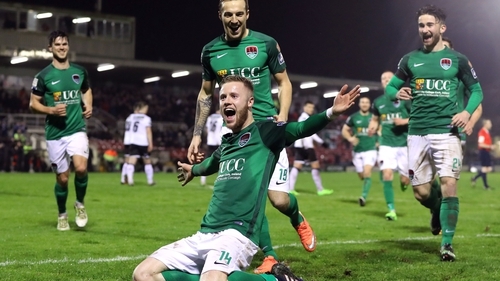 Cork City retained their President’s Cup title with a 3-0 win over Dundalk at Turner’s Cross. The FAI Cup winners, who beat the Lilywhites in last season’s decider, led 1-0 at the break thanks to Seanie Maguire’s early strike. John Caulfield’s men doubled their lead with just over 20 minutes to play through Kevin O’Connor’s well-taken free kick. With Cork having finished second in the last three seasons, the result is sure to give them hope that this is their year to overhaul Dundalk. They open their SSE Airtricity League campaign away to Finn Harps next Friday, while Dundalk host Shamrock Rovers. Maguire, who notched 28 goals last season, put the hosts ahead in the 15th minute after latching on to a long ball from Garry Buckley. The match-winner in the Cup final skipped past Paddy Barrett before shooting under the legs of Gabriel Sava from an acute angle. The Leesiders had the ball in the net again in the 25th minute but effort was ruled out for offside. Down the other end John Mountney forced an excellent save from Mark McNulty, the Cork stopper somehow getting a strong hand a goal-bound header. Maguire had a late chance to double the Cork advantage but was driven wide after rounding Sava and could only find the side-netting. The weather took a turn for the worse upon the resumption and Maguire had an early chance to grab his second but saw his shot from distance deflected over the bar. Not long after Patrick McEleney and Michael Duffy combined but the latter seemed to miscue his cross and Cork cleared. The same pair were involved moments later but McNulty raced off his line to avert the danger. With just over 20 minutes to play, Barrett brought down Dooley outside the box and O’Connor struck the resulting free kick into the top corner. Sava managed to get a hand to the ball but couldn’t prevent the left-footed effort from finding the target. Dundalk pushed to get back into the game but their momentum was stalled when McNulty and Ciaran Kilduff collided and both required treatment, with the striker leaving on a stretcher with a bad cut on his leg. The referee added five minutes and it was enough time for Karl Sheppard to complete the scoring with a fine individual effort.